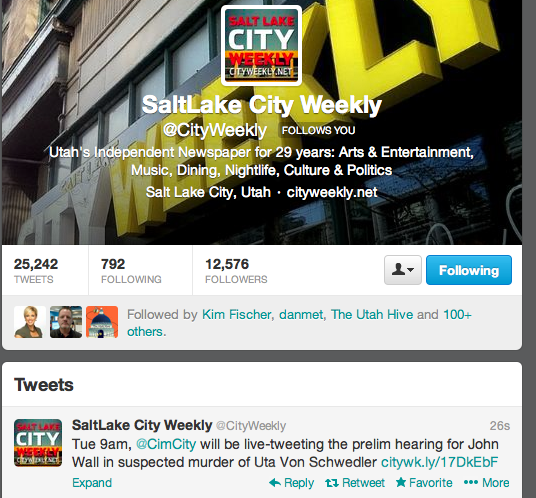 Judge orders John Brickman Wall to stand trial in murder case of U of U biologist. Utah 3rd District Court Judge Robin Reese found probable cause to move forward a murder case to go to trial. The case, involving the death of a U of U biologist from the Sugar House area who was found dead in her bathtub. Uta Von Schwedler's ex-husband, a former pediatrician for Wasatch Pediatrics in Murray is accused by prosecutors of killing Von Schwedler. On Oct 21, a judge will arraign John Brickman Wall, 49, on his charges of murder, and aggravated burglary, both 1st degree felonies that could put him behind bars for life. During the final minutes of the hearing Judge Reese explained why the case would be bound over and says it's believed Johnny Wall murdered Uta — Wall slightly shakes his head no. He chained up by the guard and taken out of the court room. No trial date has yet been set. Stay tuned for more updates! LIVE TWEETING: John Brickman Wall Murder charges Preliminary Hearing DAY 1 of 3.